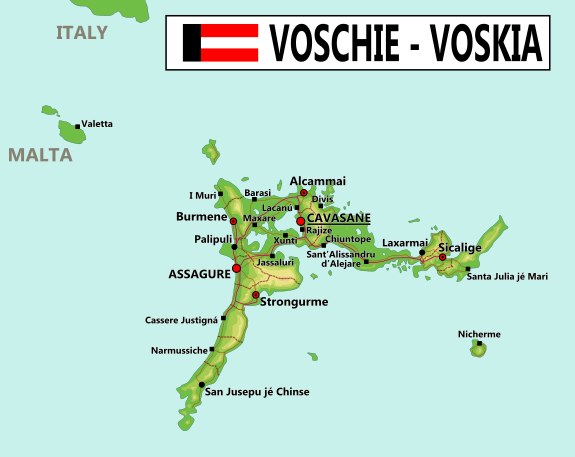 The Republic of the Vosks and the Gurds ('Voskia' for short) is a republic in southern Europe, bordering the Italian region of Calabria by land and Albania and Greece by sea and centred around a deep passage between the Mediterranean and the Adriatic Sea. In history the country was mostly part of other realms, most importantly the Kingdom of Two Sicilies and subsequently the Kingdom of Italy, until it became an independent kingdom in 1946. In 1993, a military coup was staged by colonel Pāvus Kezimidz and the royal family was sent into exile, after which the country became a republic. After Kezimidz's sudden death in 1996, democracy was quickly restored. The impact of the worldwide financial crisis that started in 2007, has been severe in Voskia. Languages: Voskian, Gurdian, Romansh (official), Italian, Greek, Albanian, etc. Parliament: unicameral parliament of 229 members called Bōvēa (Voskian), Kuvendi (Gurdian) and La Dieta (Romansh). Since 2010, there is an election threshold of 3%.